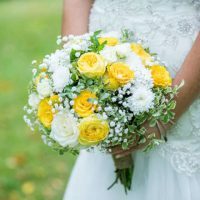 Soft, pastel colours are still very much amongst the first choices for weddings however many couples choose bolder, brighter colours such as orange & yellow. With its large petals and its big heart, the sunflower is growing in popularity and is ideal for a rustic, country chic wedding theme. It is robust: Sunflower stems are rather strong therefore, with some precautions, you can slip them in the bows of your chairs or use them to decorate your arch. For your table decoration, how about small sunflowers in pretty jam jars? It exists in different size: Sunflowers come in several sizes therefore you can use them for your centerpieces, your ceremony aisle, etc. Pop 2 or 3 medium-sized sunflowers in jars decorated with a piece of rope, raffia, string or a ribbon or simply place one large sunflower in several glass bottles and display them along the aisle for a simple but effective summery wedding ceremony decoration. How about placing them on tree stumps for a nice finishing touch? It is cheap: As the sunflower is quite affordable, you won’t have to take out a loan if you wish to fill vintage watering cans, buckets and wheelbarrows with dozens of sunflowers! Furthermore, the beauty of the sunflower can be easily enhanced with any kind of greenery such as ivy, fern, pine cones, moss, twigs, bamboo, etc. I have always loved how sunflowers make French fields so bright in the summer. I love how they sway in the wind to finally bow their head towards the earth as the sun is falling behind the horizon. 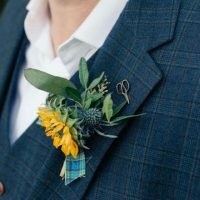 This is the reason why I am always happy when the sunflower is the star of the show: In the bridal bouquet, as a bridal crown or a groom’s buttonhole. How about a bright yellow tie to finish the look? I hope that the attached images taken by the talented French photographers Gaël Sacré & Benjamin Mineau will make you want to invite the sun to your wedding.